priced supply dwindling in the major markets such as Oregon, Colorado and Kentucky. We track changing in pricing through average rates of Isolate, which is a true Hemp commodity. Due to the extreme growth of the Hemp industry and pricing speculation, prices have swung wildly. This is our analysis of what has happened in the hemp market. The first correction started after the harvest where Biomass was readily available and the demand for Isolate was skyrocketing. Kilo prices were easily sub $6,000 for bulk, and small orders were in the mid 6’s. Prices began to creep up due to a bottleneck in scaling up manufacturing CBD, and Hemp lots priced below market value hemp disappearing. The industry started to settle on a market price for the Hemp biomass, which we track via the impact on Isolate market rates. Prices started to rise to 7k. With manufacturers producing more Isolate and processing more hemp raw material, for the first time the farmers are in the driver’s seat. Farmers recognize that demand for hemp is growing, while the supply is shrinking. As a result, the market for higher prices for hemp biomass begins to rise. The manufacturers react to this increase by pushing the average price of a kilo up to $7.5k – $8k / kilo, which they learn the market is willing to pay. The market expects the price to rise even higher. As the fall hemp harvest looms, we expect to see a 5x in total production of Hemp in the United States. With harvest around the corner, the market is more informed if we will run out of material. 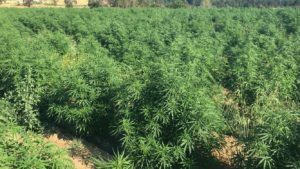 Farmer’s who are holding onto hemp lots are starting to feel the pressure to sell their crops before the market is flooded with new material. This is a gamble – hold out long enough, get a premium for your material, hold out too long, lose half the value. The most recent correction is due to a stabilization of pricing, and the market maturing. Solid connections for consistent buyers are returning to a mid 6k price point, and single kilos are below the $7.5k mark. My prediction is the market will split into two sectors. The well prepared processors will have secured contracts to source enough biomass until the 2018 harvest, and the processors who will be at the mercy of biomass spot buys. I believe large manufacturers will keep their pricing stable through harvest to capture market share in anticipation of a market shakeup with the 2018 harvest. Work on a solid supply chain, find great brokers to provide stability in sourcing, and find someone who answers their phone and is responsive.